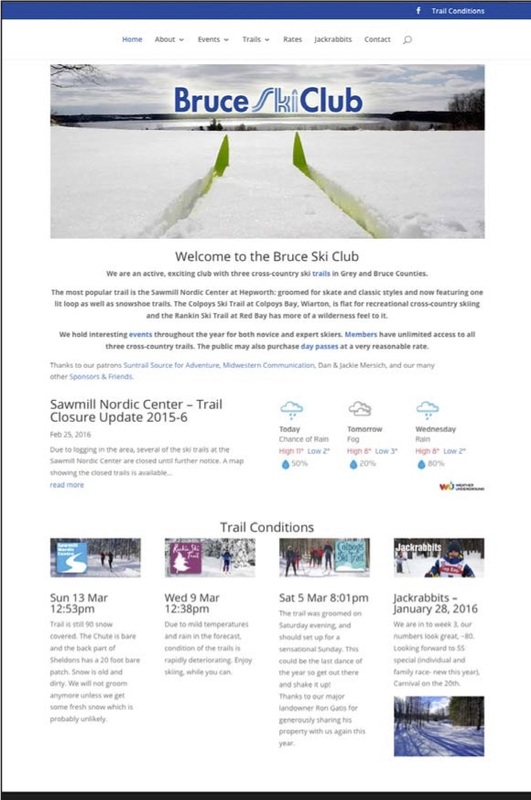 Now that spring is almost here, we thought that it was time to give the Bruce Ski Club website an update. 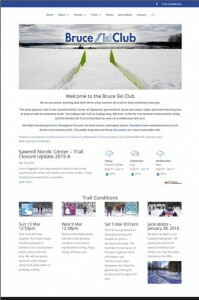 It’s the same address (http://bruceskiclub.ca), but the website has a clean new look. Gone is the blow-up of the Pro l binding. Now we have the great shot that Colpoy’s trail captain Martin Kerr took of the ski tips overlooking Colpoy’s Bay. There are other changes as well. In the end we hope that it will be easier to maneuver around the site and find what you are looking for. We can thank our vice-president, Shawn Radcliffe, for creating the site. After doing the basic layout, Shawn listened to all of the executive’s nit-picking and ideas, and then quietly made the changes, trying to accommodate our whims. The good thing about this site is that Shawn created it in WordPress. This will allow our executives–like the race coordinator or Jackrabbit leader–to update the website without having to wait for the webmeister to implement the change. The process should be more timely and up-to-date and the website will be a more reliable source to go to for finding out stuff like when a race is happening or how much is that Moonlight Ski. As we get more familiar with the site, there will be changes made to improve the flow of information. That is the beauty of this design… It is flexible. We welcome your feedback on the website, including what’s working and what’s not, what information you’re having trouble finding and what information you’d like to see. To share your thoughts with us, send us a message on our contact form.